This is a great salad. It is perfect for a luncheon, brunch or any party because you can make a huge ​bowl and it looks beautiful!!. You can even make the chicken ahead of time, so you're just putting together your salad at party time. The chicken is so flavorful, yet so easy. I tried a new line of dressings. It is called "Cindy's Kitchen". They have amazing products. There are so many that I love. The Chipotle Ancho Vinaigrette......incredible. 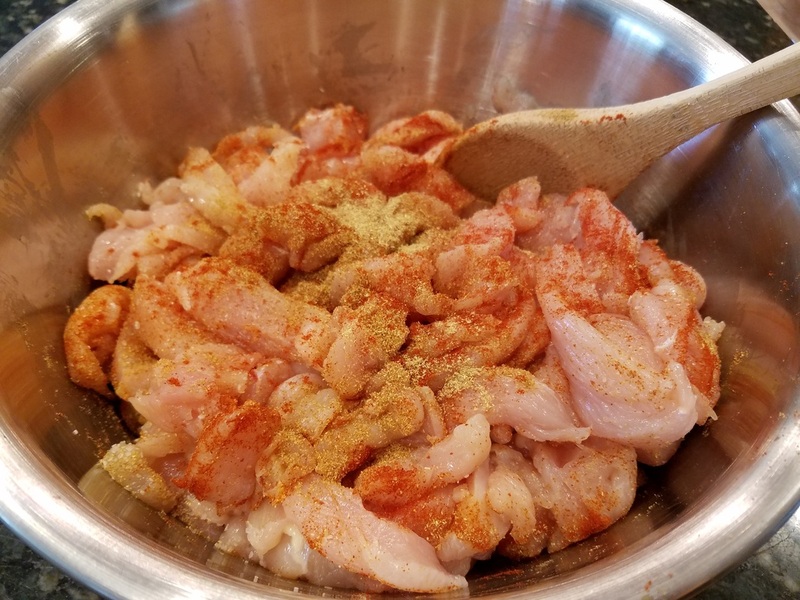 I use it to make different dips, grilled shrimp and on yummy chicken. It is fantastic. Try all their products. They have a lot to offer and they are wonderful. Slice your chicken into thin strips and small pieces. Place in a bowl and add the corriander, cumin and paprika. Mix well to coat. Heat the oil in a large saute pan and add chicken on a high heat. Cook on a high heat the entire time. Toss to cook completely through. As the chicken is cooking it will release a lot of juices. You can drain some of this, as it is too much to cook off. When your chicken looks just about cooked, add the juice of the two limes and all of the sliced garlic. Click on the image below to check out one of my favorite tools "The Pampered Chef Garlic Slicer," it is really the best! Continue cooking and add about 1 cup of that amazing Cindy's Kitchen Chipotle Ancho Vinaigrette. Toss to coat. Again, keep cooking on high. This will now start to brown or blacken your chicken. After about 4 minutes, when the liquid starts cooking down....add another cup of the vinaigrette. I usually do this in three additions. It will create a great sauce. Now, turn off your heat and add the one cup of brown sugar. This will take it over the top and give it a sweet side to help balance out the heat. Amazing!!! Now my son likes me to make some rice at this point, he loves it just like that, on top of the rice. Or, you can carry on and chop your romaine in a large salad bowl. Add the cut tomatoes, chopped scallions, shredded cheese (whichever type you prefer) and a couple handfuls of crushed tortilla chips on top. 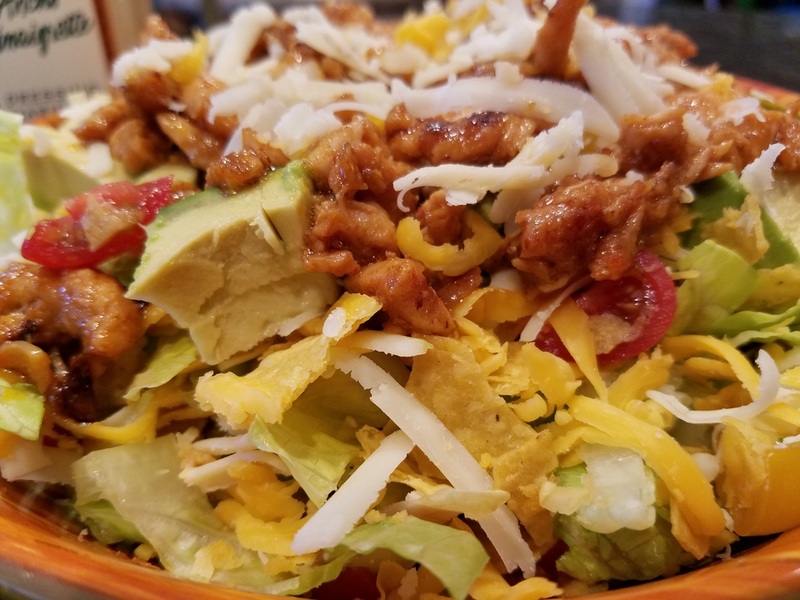 Top it all off with the chopped avocado and that amazing chicken. You can use what is left in the bottle of vinaigrette for a little extra dressing on top. ENJOY!! !